This is certainly a "if/when you have time for it" feature request, but it is one of the few things I still go to Google for and I try to do that as infrequently as possible. I figured I would let you know and you can implement it or ignore it, but at least then I will have let you know about it. Google has the ability to filter search results by date and it would be great if DuckDuckGo could do the same. Often I am looking for something and just want current or current-ish results (e.g. if searching for a bug in OS X, I don&apos;t care about results from 2004 because it&apos;s likely been fixed since then). 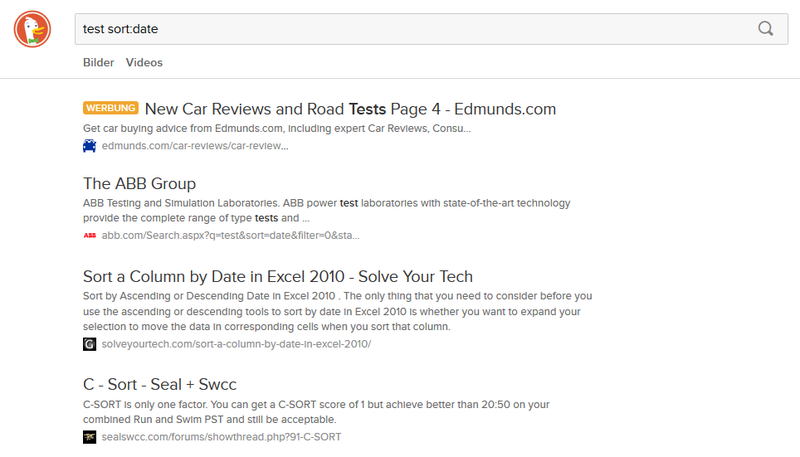 Sometimes, when searching for timely data such as this on DuckDuckGo, the result I am looking for is lost in older (irrelevant) results so I use your !g bang to pop over to Google where I can easily tell it to filter results to show only those from the past year or past month or past week. We actually implemented this recently. You can type in sort:date after your query or use the drop down next to the search box. This is truly amazing. This thread is 3 years old and the relatively simple problem is still not addressed? c'mon alitte more convenient wouldn't hurt anyone. On the help site about this it states "If you use our sort by date feature (for recent pages) there is a date displayed next to each domain.". However this is not the case. In my case it displayed the results as it normally would only sorted differently. Okay, a question without a sensible answer after almost 5 years --- why, and what resolutions are available? And what are the threats of not providing a solution? 1. What's the problem? The problem is that, from a marketing and R&D perspective, DDG have acquired an audience and customers with an initial belief in DDG's service. DDG's customers/users repeatedly set out (very well) a need for a specific feature: a simple mechanism, probably in menu form, to filter searches by date. DDG staff, much as we love what they've done, failed to implement this feature and obfuscated their answers instead of delivering simple, apparently honest, responses. 2. What's the reason for the problem? The reason for the problem is that, for a variety of reasons, searchers wish to move away from big G. In parts, this wish is prompted by privacy issues and G's manifest control of searches. 3. How can DDG resolve this problem? DDG can a) provide a simple date filter menu similar to G's, and b) provide an API for developers to write plugins, one of which will inevitably be a date filter menu. 4. Would DDG benefit from solving the problem? The European Court of Justice in Schrems caused major problems for G. It opened a short but very powerful window of about 6-12 months for search providers like DDG to attack G's market share and acquire massive audience. This, in turn, will boost DDG's business model, opportunity for growth, and attractiveness to investors. 5. Threats by DDG's failure to quickly solve the date filter problem include credibility failure, killing the business model and repelling audience. a) As regards credibility failure, this thread says it all. 5 years without a competent answer is a good way to be perceived as geeks: all brains, no common sense. b) As for killing the business model, would you invest in someone that skirts around answers to problems? c) And as for repelling audience, how many searchers have come to DDG, been disappointed without a date filter, and gone away, and have then told others but not DDG? Don't stab the baby! I've seen this type of problem so many times over 40+ years in business and project development. It could be solved with agile, a one day scrum or a change of leader. First resolution could be achieved with a tardy secondary search filter (as others have indicated), and refined later. However, in my view it would be wonderful if DDG would provide an API to allow the wider development community to pitch in. Carrying the worldwide developer community could advance DDG's ambition at speed. I just started using ddg, and would love to recommend it to pretty much everyone, except for this. if I have to go to google just to get recent results, that are relevant to my query, then ddg becomes next to impossible to use. The whole sort:date thing doesnt work at all, and the !gmonth thing does, but just brings us back to google - not good! Any luck on gthi as all? I am aware of the sort:date feature, but what I am looking for is different. Let me try to explain. I do not want to see the results sorted by date, but rather the results sorted by relevance with the date used to filter out some results. This is distinctly different from getting all results, regardless of their relevance, sorted by date. I rarely care about the most recent update on any given topic, I generally want the best result that occurred within a certain date range. I have the same request as the previous poster. Most of the time I am looking for "Most relevant in the time X" rather than "Sort by date". Thus a query like "ubuntu how to do foo" becomes more meaningful when I get the "most relevant results in the last year" rather than just results sorted by date. Yes, I completely understand and agree. I just haven&apos;t found a great provider yet for it. It appears that you have the date information in your provider&apos;s search results. Since you have that information, and you can sort the results by date, I do not understand why you cannot filter it by date range. The computing cost of a filter is less than a sort. A command line version should also take the form age:!this week returning only those search results from more than one week ago. Useful when you are trying to look up historical data, particularly when some recent event has generated thousands of search results for the same search string. The advantage of the command line version is that it keeps the duck duck go page clean, and requires only a single page serve. The disadvantage is that users may not know of its existence. date relevancy has been a real issue on the net from the beginning. date of event? date of posting? date discovered? search engines to my perspective have mostly failed to differentiate between events and objects and in a real mode way. all the about events and about objects are not meaningfully applied in a perspective hierarchy of "the world as we see it" context. i mean if KK is spotted wearing a new dress, what are the date stamps for that? a most difficult proposition until we define a "world reality hierarchy" index. it's at least as complicated as the patent library. Any kind of date restriction is better than none. You can type in sort:date after your query or use the drop down next to the search box. ps where is "end quote"
I know this thread is old but is the only one I found about this topic. I wonder if the date-range feature has been implemented yet or a lab that could be enabled? No, the date-range feature has not been implemented yet. Great discussion. I would have to say that the only search functionality that I still go to Google for is date range searches. If you could add the ability to search within a date range I would Google no longer. I agree with the previous comments. The ability to do a date range search is basically the only thing that keeps me using Google. If DDG can make this happen I will happily abandon Google search forever! Its the only reason I still use Google search, even though I hate its silly defaults. It&apos;s the same for me. I still use Google because of that filter to search for results of the last hour or whatever. Add me to this request as well. And thanks for giving us an option to google. Yeah that future to filter search by date range and the last hour, day, week... would be very helpful. Also it would be nice to see the date related to the search result shown in the search page, if it exists, like in google. e.g. In google it shows up in front of the description: 8 Feb 2012 – The latest news and information about federal pay and performance for the government employee and manager. I just did a search for information about an online gaming tournament that&apos;s happening right now called "iem" but all the results were from last year&apos;s tournament. Tried to figure out how to get what I wanted ("iem clg curse results") for this year but no dice. Went to Google, got it in 2 clicks. +1 To this date feature. (In an easy way). If I search DuckDuckGo with a !gyear syntax, does that search compromise my privacy or bubble me in the same way that it would if I did such a search directly through the Google webpage? If so, is there any way for you to re-present the search result on this website to maintain search privacy? It&apos;s about the 3rd or 4th time that I try to use DDG as my all-day search engine. The times before at the end I was always back to Google because of just one thing: the date filter (&apos;last year&apos;). And I can already predict that this time it will end the same way, rather sooner than later. Please implement a date filter. &apos;Natively&apos;, not as bang redirection to Google. If you are searching for e.g. computer related stuff it&apos;s so essential to have a date filter. A hit from 2005 on the 3rd place is completely useless. This shouldn&apos;t be too hard to get. Stop repeating the ability to sort by date. This is not what anyone&apos;s asking for. We need the ability to filter by date, and then have the results automatically sorted by relevance. Huge difference. Without this your search is crippled. If one more voice helps, let me wholeheartedly add mine to the call for date filtering. If a bang search to Google or other search engine is comparable to going there directly (which the post by Zacbranni copied below says it is) as far as privacy/tracking is concerned, what&apos;s the point? And the post he mentions refers to adding the date sort but not a date filter. We&apos;re working on integrating more date options but, because of the multiple sources we use, it&apos;s difficult to do. It&apos;s definitely on our list, though! Adding another vote to the queue for for implementation of the of the date range search feature. The sort by date option is ok (ie better then nothing) but as several previous posters explained in detail doesn&apos;t really cut it esp for those of us doing a lot of current tech searches. Can you try again now? Blekko&apos;s API (where most of the date results come from) is a bit unstable -- may have been acting up at that time. Can !date be embedded somehow so that it is a default search filter? It sure would increase the duckduckgo value significantly. This thread is interesting as I was recently frustrated by the number of Internet articles that are undated - and often out-dated in content - yet whoever posts them continues to benefit from a HitCount despite useless content - because Search engines don&apos;t discern and prioritize results based on the date the content was posted. Please take these requests seriously and add Date Filter / Range support. It&apos;s not that we&apos;re ignoring requests for features :) We take everyone&apos;s feedback seriously---it&apos;s our only way of knowing what our users want! This request (and a few others) are particularly tricky because we use multiple sources. That means, these sources has to support the ability to sort by date, search within a date range, etc. To keep adding certain types of features sometimes means we can&apos;t provide a diversity of results (or more accurate results). We wouldn&apos;t do that just to half-support sort-by-date. We&apos;re actively working toward adding more date support and we&apos;re constantly monitoring our sources to allow for more advanced search functions. There is no possibility of post-filtering the results you receive? Maybe if the DDG search syntax had date filters, the results when those are used could be not only filtered by date but also restricted to only the providers that report the HTTP Date fields. I'll agree with everyone else here, it's the only reason I use !g, and I do that a lot. What are the stats on how often !g is used? I&apos;ll throw my two pennies in on this one. I&apos;m with the others who lament that they have to keep going back to Google to narrow by date. I tried to replace Google with Bing a while back and couldn&apos;t do it for that very reason. I more recently discovered DuckDuck and I&apos;m ready to make it my default search engine. Unfortunately, I use the narrow by date function at least one out of every three searches so it&apos;s vital for me. I get the feeling it&apos;s not an easy thing to introduce. I&apos;m glad the duck folks are considering it, anyway. could you please stop calling this &apos;sort by date&apos;, please? because it has nothing to do with &apos;sort&apos;. it should be &apos;filter by date&apos;. Add me to the long list of folks wanting the ability to search by date ranges. The default Google ranges PLUS a six-month option would be enough for me to come to DDG for good. Until then I am forced to use Start Page. I may be mistaken, but when I search by date sorting alone, I feel that I lose out on relevance. At least that is the impression I get. I need relevance within a range, not necessarily the very latest thing that might apply. I&apos;ve come and gone from DDG many times now. I will check back again later. Just did a sample search for Apple iPad Mini and had the results sorted by date using the drop down menu. Tons of the results are from 2012 despite saying "April 11" or April 10" etc. I realize that there may be difficulties searching by date ranges due to multiple sources, but it doesn&apos;t even seem to me that sorting by date works. The same search in Google (as an example) provides far more relevant results. Now, I am not expecting DDG to be Google, but any search engine that wants to compete at a meaningful level needs to do better than this. I do not like Google for a number of reasons, but the lack of efficiency with DDG right now makes it a no go. Start Page, although there are things I dislike about it, at least gives me the results I need for the most part. It&apos;s probably sorting by modified date, not publication date. We&apos;ll take a look! I skimmed the thread and want to vote for date ranges and qualifiers like G. Maybe try to copy all the advanced search options and the special searches. Without date filtering, image and video search results, DDG is a well-intentioned but hopelessly flawed search engine. If Google is the only engine that has this capability then simply show a disclaimer advising that date-filtered results are currently limited to Google. This will make it easier for everyone to use DDG as their search portal - retaining Google search features without the privacy invasion. We do have date filtering, though, only in the form of most recent--->oldest. Please note, as mentioned above, we&apos;re investigating some issues with the modified date interferring with the publication date. If you see any examples, please send them through the form at ddg.gg/feedback for analysis. Two years? No filter date by range? Well If Bing can&apos;t get it straight (and they still seem unable to) then your relatively sparse depth of hired programming genius may find it hopeless. You will not succeed. Don&apos;t you desire to? But the fact that Google has accomplished it for a few years now has raised the bar and, as others have noted, made my use of DDG a once weekly event. Usually out of curiosity. What a damn shame. Google&apos;s results have, more and more in recent years, been wildly wide of the mark compared to Bing and DDG. I&apos;d LOVE to switch. I read the whole thread and realize that you have repeatedly assured that you&apos;re "taking this seriously" but I cannot believe that you really will until thousands, instead of this few dozen here are compelled to weigh in. It is EXTREMELY frustrating to search relevant topics, take time to dig into any one of the returns, only to discover (if you&apos;re lucky enough to even gist it from that content) that it was produced six years ago. Very often pages give no indication of dateline. That is absurd. That is so unacceptable in a search engine that I despair over the apparent lack of nearer universal demand from users, or sincere effort in response to such requests as you see here. Guest, sorry for the frustration. As you probably know, we&apos;re not operating at the resource capacity of Google or Bing. In fact, it was a little over 1 year ago that we got institutional funding, passed 1M searches/day, and launched DuckDuckHack. We&apos;ve also introduced !bang suggestions, pursued new business partnerships, made a major overhaul to our mobile app (releasing soon), and continually kept up with the changing of our various sources. 1. We use multiple sources that don&apos;t all support date search and, if they do, they support it differently (showing modified date instead of publishing date or other differences that really impact the results). When an update is made by one of our sources, we can investigate how we should tweak our use of them. But, if a bug is introduced by one of our sources, it takes a while for it to be resolved, since they&apos;re generally larger and slower moving to resolve such things. 2. Advanced syntax is not as critical to users as general relevancy. We&apos;d like to improve the search-engine as much as possible before we start rerouting resources to work on things like date sort, page previews, and other requested features. In the last year, we&apos;ve grown to 7 full timers, 13 part timers, and many many contributors. When this thread was originally posted, Gabriel had been running DuckDuckGo entirely by himself. 3. We do have sort-by-date but, as users in this thread have pointed out, there are some cases where it acts a little buggy. We&apos;re still tracking down the common denominator to those problems and they should be fixed relatively shortly. It sounds like what you&apos;re looking for is more of a full-fledged date search, where you show results from 24 hours, 1 day, 1 week, or from a range (12.2.2012 - 2.2.2013). Is that correct? Growing means growing pains. Tending to small things like this (though they may not seem small to you) are very important to us as users of our own search-engine. Trust us! We&apos;re a group of people so motivated by redefining the search-experience that we&apos;ve made it our lives. Everyone on the team is an inbound user. I don&apos;t think there&apos;s anyone here that wouldn&apos;t like to see us do more with dates but, given our current standing and the above factors, there are more important things to be working on (like redefining what image-search is). The best thing you can do as a user is to submit feedback on the queries you see with poor date search results. We look at all of them and, considering not many people use advanced syntax, we always need more examples. Also, if you can think of a way to accomplish any type of date search via an instant-answer, you can suggest it or develop it yourself. I can see this search by date thing has been ongoing for a few years. I was after an alternative to google. I tried your sort by date, but it sorted by month, and thus have 2011 items before 2013, because its sorted by month not year. I certainly hope your systems guys would have been better educated on this. It takes a lot to get someone in your store, but no remedy to this in such a long time, means there is no need to come back soon. Not a good business model. What was the example query? That&apos;s more helpful. I just suggested new !bang&apos;s for Start Page with date filter. (!s24, !sweek, !smonth, !syear analogous to !g24 …) Hope this helps some privacy-concerned users. That would be a great idea! Sounds good. @zacbrannigan and others: If you&apos;re able to sort by date as well as sort by relevance, you have all the info you need to do a relevance sort restricted by date. +1 for date filtering. Not having it is a deal breaker. I would love to leave the google behind but I frequently need to filter results to the past month or year. +1 from here too. Recently I tried migration again but it was hopeless due to lack of date filter. Queries in non-english languages (ie. finnish) generally don&apos;t work well enough but i can live with that. Date filtering however is something that is present in almost every query i make..
And I hate having to pull down an extra pane and choose the time range with every single Google query... just loathe that extra step, but without it, search results grow more meaningless every day. Would you want to see a Wordpress how-to from 2008? And the devices are changing so fast ... the default ought to be within past year, with easy selections for other date ranges. Put the rest in a way-back machine, because this is now a search imperative, and the outfit who gets it first is going to be .... big! Thanks for the pointer to startpage. Didn’t know that one and indeed it seems to be a good replacement for DDG. Have to agree that DDG is useless to me without the date filter. "The ability to do a date range search is basically the only thing that keeps me using Google." I&apos;d love to abandon Google completely [and any other company that was taking money from the government in exchange for compromising our privacy aka PRISM), but a lot of my searches require me to filter by date (updated within the last 24 hours, or updated within the last week, etc), so I&apos;m forced to go back to the evil empire. I don&apos;t think anyone has said the magic word yet ... "please"? p.s. Eveything else works GREAT! A date filter would have me using DDG all the time too and recommending it to everyone I know. I second the thread opener's request. This definitely is my biggest issue with DDG, that forces me to go back to Google. That's great news for me, how you do that? Somehow I totally missed this feature. Yes it seems that sort:date returns a very reduced results list and it's not the same to sort the results than obtain a results within a range date. This feature is very interesting and necessary for many users. This is clearly a difficult issue for you to resolve and can relate to that. That said, I have to agree with the other comments here that DDG is not a realistic option for users switching from Google as it stands. I have tried many times over the years, this last attempt being the longest, about a week. But the issues around dates and relevance of a search means I just switched back to Google again, unfortunately. Firstly, I don't want to add S:D or other appendages to my search most of the time. If I enter a search term, especially if it is tech related, results from 2006 are not helpful. Relevance at a very simplistic level is a combination of match, popularity and date. If there are results that come back which I deem no longer relevant, the filter is an essential tool. Like others have said, it isn't sort by date, but rather still sort by relevance, just older ones are removed. I would love to stay with you, for everything you stand for, but this is a deal breaker unfortunately. Something, even if it wasn't 100%, would be better, as it is, I just can't get to what I need efficiently enough right now. Speed is assumed these days, not how quick the results come back but rather getting to the answer. Please, please, please. Pretty f^*!ng please with sugar and frosting on top, please add this feature. This really is the one thing that's missing from ddg. I'm not gonna criticise, I know if you could implement search by date you would, but I'll add my voice to the choir anyway, just so you know how much people want this. As well as specifying a time frame for a search, just having the date (either when published or discovered by a web crawler) of the page displayed in the general search results, without the need for extra syntax, would be a massive step forward. Having those dates really helps when looking for relevant information. Your sort:date feature has improved over the past year and I hope you have success with the above. Add my voice to the chorus. Difficult to use DuckDuckGo when you are trying to track down software problems. Signed up for an account for this. Seems like the G like "filter by date" still hasn't been implemented, and the "sort by date" feature is completely broken. The example searches in this thread on the "sort by date" all return "No more date results." Just adding my quack to the chorus (is it a chorus of 'quacks'?). I think Google have it pretty much right, with day/wk/mnth/yr and along with many others I finding myself reluctantly using Google for about 50% of my searches simply to filter by date. So it's a fact you are losing users by not having this feature, just don't know if you can figure out how many. I also think it simply has to be an easy to see & use menu on homepage, rather than a '!' option which users may not remember or be aware of. As a brand, new user of DDG, I had high hopes for it being a viable alternative to that "other" search engine with all it's tentacles probing all the recesses of my life. I quickly realized the shortcoming of not being able to customize my searches to only show the "latest and greatest" and figured it had to be a setting somewhere. To my surprise and disappointment, I could not find such a setting. I then found this post which appears to confirm why I couldn't find the setting...there is no, such setting. I, like many others here, will continue to reveal myself to Big Brother Google while ducking back onto DDG from time to time, patiently waiting for that setting to be made available. It's a good start and I have faith the DDG brains will figure this one out. BTW I also like this idea. Just created an account to add my +1 for the search by date-range feature. has this been done yet?? Ahh okay. It seems to be fixed now. Just to add my voice to this. I wanted to switch to DDG but quickly found that lack of date features made it impossible to use. I often need a search with a specific time scope e.g. within the last year for a search on Wordpress development; within the last month for a search on a hearthstone deck; or within the last 24hrs for a search on news of current events. Even when not searching for a specific time period I hadn't realised before just how much I rely on a date being shown next to a result for an indication of how useful the result might be. Somebody mentioned in the thread that a date was added when using "sort:date" but this doesn't work for me. Neither do I want the results sorted by date, I just want results outside a specified date range filtered out. I understand you guys are working on this, I hope a solution is found. Good luck! Beside others, I also would like to express my need for date range searching. It is an *extremely* important feature. It is very hard to convince others to use DDG over Google if they have to switch back over and over again to Google to make a date range search. This is the only reason I still use Google sometimes. And I'm not happy with it. This is pretty important. And also keeps me going back to google. We are the small minority posting here, and most likely many others just go back to google without spending so much time for this feature? The funny thing about this is I did a search using DDG for how to show recent results and it brought this posting up which is 4 years old. What brought this up for me today was trying to figure out why something isn't working in iTunes. But I don't want to see issues that were posted longer than a year ago because it's not relevant. I tried the sort:date in the search field, but that doesn't sort by date, and just adds those works to the search? Any further updates on this issue? It's not ideal having to jump back to Google when you need this kind of functionality. As time goes on, the results from DuckDuckGo are going to get worse not better as especially with technical queries, the search results I see relate to operating systems long since out of date. +1 for a way to show relevant results in a specific time period. !date or sort:date not sort by date (at this time) the response of a spécific search ? Would like to add my vote to this! There are endless lists of !bangs that will never be used by the majority but cost development time. While the filter by date range feature is something we all need these days to filter out old stuff from the relevant results. Without this DDG is only able to search old crap or search irrelevant recent results. This is consuming more time from all the users that have to filter out by hand or search on 2 engines to find an recent relevant answer, than the total development time to implement this. Another +2 for my wife and I. We both use DDG for everything... except our date-specific queries. Looks like our story is the same as most everyone here. I, too, joined this board to comment here today and we also desperately wish to get off the 'Alphabet' train as soon as possible. This feature is the single deal-breaker for us and the orientability-in-time of search results is getting exponentially more important by the day. I was also surprised to find that even now, near the end of 2015, this is still the only place I found discussion of this feature's absent from DDG -- but the more I think about it maybe that's because I searched for it [in][/i] DDG with the sort:date option... which means this debacle is becoming self-referential now. Please help us before we go insane... or worse, go google. I vote for this too! I 've been pretty happy with DDG. I tried to get someone else off the G and onto DDG. For two minutes things seemed peachy but then the dates thing was discovered. Their back on Googs now and won't be returning. Real shame. "Product plans for 2016 include adding time and date filters to our search results, improving the "Did You Mean" feature, and making it easier for developers to contribute so that many more useful and fun Instant Answers can continue to be added." I'm looking for tech information - getting a 7 year old hit is worthless to me. I'm happy to see that the latest DDG comment is that date filtering is on the 2016 to do list - I just don't understand how it could be that difficult to add, especially after 5 years! I'm missing this too and it remains so far the biggest issue for me in switching to ddg completely. I would suggest adding a switch/switches below the current "region" switch on the top-right of the search page. I can't believe this is still a thing after years have gone by. DDG is useless to me. Now that StartPage is also being watered down (no longer shows site URLs in results), I'm hoping to find an organization that actually gives a crap about functionality beyond the layperson's needs. Very disappointing. Actually, adding "s:d" (no quotes) does sort by date. It just doesn't list any dates, so it's hard to tell that it's working. I think I can live with this. It's quick to type and seems to work. The sort by date is not a solution, in fact this is even worse. When I want to search something within a year I want to have the best result from the last year, with a sort by date you will get the most recent first even if they are not good. In my case the search by date is an option that almost every day I should use and I thing it is one of the very basic option a search engine should have. Without this option a lot of search I do on my work are really useless and here you have the option to return fresh results even if they are not good ones or results that are not usefull today because they are old and are not applicable today. This thread is now over six years old and even though I came back again still wanting to replace google with ddg it's still useless without sort by date+relevance.